Our company is a renowned Manufacturer, Exporter and Supplier of Pre Compressed Spring Hanger (25 mm). The Pre Compressed Spring Hanger is extensively used in suspension of water pipe lines and seismically restrained rotating equipment. The frame of our Pre Compressed Spring Hanger is made of G.I. Steel and powder coated to 100 microns paint thickness (exceeds 1000 hours of salt spray test), conforming to ASTM B â�� 117 standard. Our hanger is designed with a printed deflection scale to indicate total spring deflection. 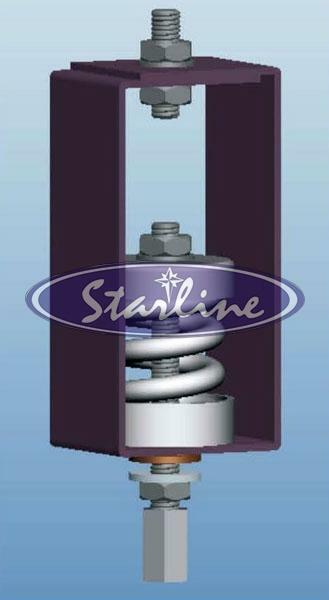 We specialize in catering to the bulk requirements of Pre Compressed Spring Hanger with utmost ease. Direct connection to lower suspension rod by means of a threaded rod coupler. Printed deflection scale to indicate total spring deflectionl. 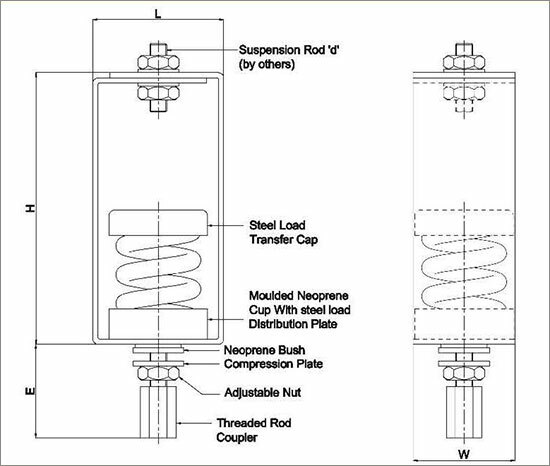 Pre compressed spring effectively minimizes transfer of variations in pipe load during filling of pipes thus protecting equipment connections / Flexible joints and also prevents overloading of the main equipment isolators. Springs are powder coated with appropriate color coding to facilitate identification. Frame is made of G.I. Steel and powder coated to 100 microns paint thickness (exceeds 1000 hours of salt spray test) and conforming to ASTM B â�� 117.